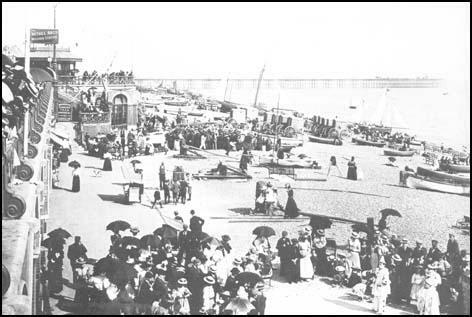 Crowds of holiday-makers on Brighton beach were bound to attract traders and entertainers. Vendors of food and drink, hawkers selling souvenirs and cheap jewellery and musicians and beach entertainers were joined by itinerant photographers. In the late 1850s, visitors to Brighton could return home with a cheap collodion positive or ambrotype portrait taken at one of a dozen or more studios in the centre of town. 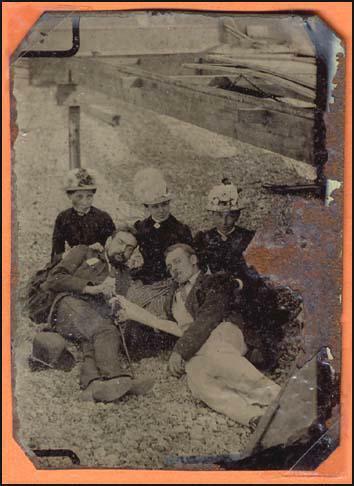 In the 1860s and early 1870s, visitors could obtain a souvenir of their stay in Brighton in the form of a carte de visite portrait, available from nearly three dozen photographic studios. 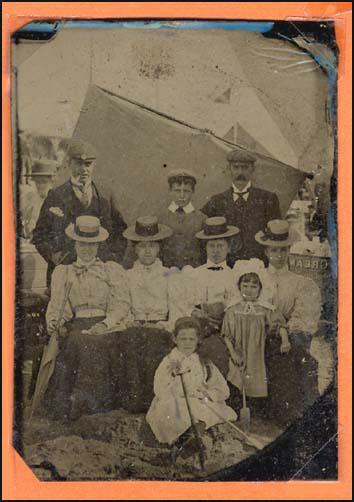 From the late 1870s, itinerants equipped with tintype cameras descended on seaside towns and with the advent of dry plates and 'instantaneous' photography in the 1880s profesional photographers could leave their studios and come down to the beach to find customers. In Brighton, professional photographers could set up small studios and workrooms in the Arches under the Kings Road and still maintain better equipped and more orthodox studios in town. 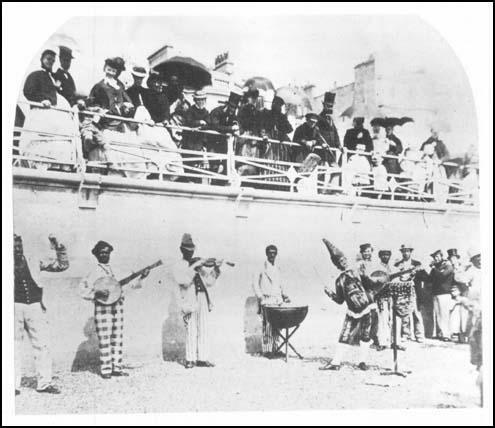 In 1878, for example, William Dawson was operating a photographic room alongside the beach, near the West Pier, yet at the same time his firm of Dawson & Co had a studio in Brighton's London Road. 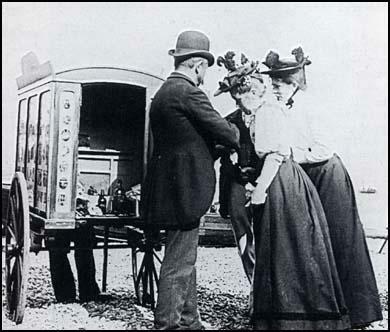 In other seaside towns in the south of England, such as Hastings, beach photographers carried portable dark rooms on little handcarts, which they trundled over the beach itself. A number of the photographers who wheeled handcarts along the beach produced tintype portraits on a "while you wait" basis. The tintype process was particularly suitable for producing "instant portraits".Many of the beach photographer's customers were "day trippers" and so it was important that the photographic portrait could be developed on the spot. Beach photographer with his portable darkroom on wheels. The tintype portrait was ideal for beach photography, in that it was cheap, fast to produce and processed on a durable metal base, rather than a fragile glass plate.Tintype portraits were sold for as little as 6d each, being the cheapest format of photographic portrait available. 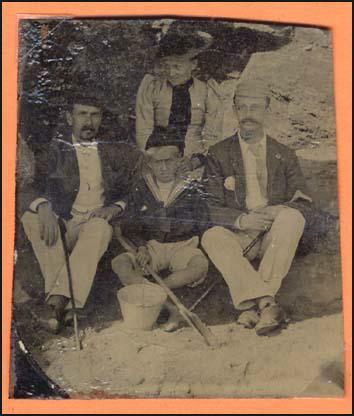 Tintype group portrait taken by a beach photographer(c1892). Tintype group portrait taken by a beach photographer(c1895). Tintype group portrait taken by a beach photographer (c1892). At some seaside resorts it was necessary to pitch a large tent on the beach to serve as a temporary studio and darkroom.In the age of wet collodion and ambrotypes some itinerant photographers found it necessary to arrive on the coast in a customised photographic carriage.In the late 1850s, Mr H Neale from Tunbridge Wells made seasonal visits to Hastings in the Monarch Photographic Carriage. In Eastbourne in the early 1860s, Mr Bennett's Photographic Carriage would arrive each August "for the season". In Brighton it was possible to establish small permanent photographic studios alongside the foreshore.Over a long stretch of Brighton's seafront, a series of small shops occupied the arches below Kings Road. From the mid 1870s, beach photographers were able to set up small studios and photographic rooms in the Kings Road Arches, from where they could operate a beach photography service. On the eastern seafront near the Chain Pier, small photographic studios were established on Madeira Road ( now known as Madeira Drive ). It is difficult to say exactly how many photographers were working Brighton beach at any one time. Evidence form other Victorian seaside resorts suggests a large number. In 1882, a policeman estimated that on one particular day some forty to fifty photographers were working on the sands at Ramsgate. In Blackpool in 1895, around three dozen beach photographers were counted on a single day. However, in Brighton the situation may have been rather different. At the time of the 1901 Census, there were over 160 inhabitants of Brighton & Hove who were working in the field of photography. Out of this total, only 18 can be classified as independent photographers working on their own account, but not based in a photographic studio. The 1891 Census was carried out on 5th April and the 1901 Census was taken on 31st March 1901, a period of the year when beach photographers would not have been very active. It is likely that a number of photographers travelled down to Brighton from London for a particular Bank Holiday. The existence of permanent photographic studios alongside Brighton's seaside promenades did not deter itinerant portrait takers and freelance beach photographers. Audrey Linkman, who has made a special study of itinerant photographers, has trawled through the minutes of the Brighton Beach Committee and discovered evidence of disputes between resident studio proprietors and photographers who operated near their premises with portable equipment. In her book, " The Victorians - Photographic Portraits ", Audrey Linkman gives details of a series of complaints against interlopers made by proprietors of the Chain Pier Studio located on Madeira Road. A letter of complaint from Alfred Sharp of the Chain Pier Studio was received by the Brighton Beach Committee in January 1881. In the letter, Alfred Sharp makes a grievance against Thomas Foulkes, whom he alleges was standing near his premises on Madeira Road " with a box and camera for the purpose of taking photographs". In fact, Thomas Foulkes was not an itinerant photographer but a professional photographer who had previously operated a studio on Brighton's western seafront.Over the next year or so Mr Sharp wrote letters of complaint about a competitor working at Arch 15 under Junction Road and another opposite the Aquarium Clock Tower.